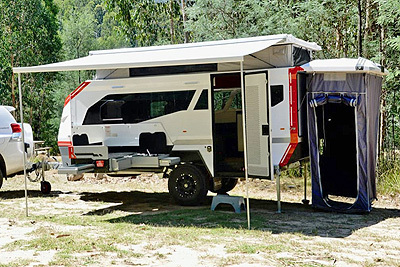 QUALITY Australian Made Camper Trailers for Sale. Your one-stop-shop for all things camping! 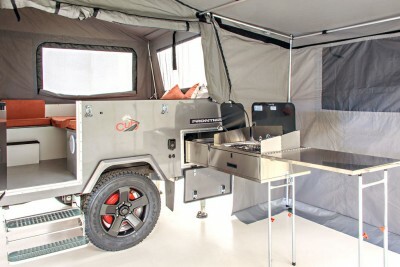 We have both Hard Floor and Soft Floor Camper Trailers for sale fitted with Australian Quality Canvas tents. It is the attention to detail and commitment to ongoing product improvement that sets us apart from our competitors. All our camper trailers come equipped with a number of unique features, along with a range of optional extras to choose from. We have many optional items from which to choose so you can customise your camper trailer to suit your needs. Track Trailer® is a manufacturer of high performance off road trailers. Our product range is focused primarily on recreational camper systems, but we also manufacture high performance off road trailers for commercial and military use. 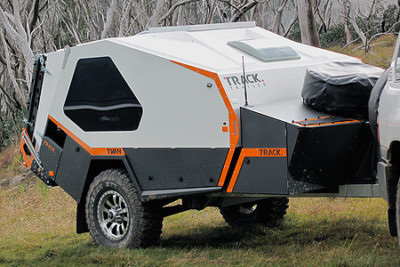 Track Trailer is an Australian based and Australian owned company distributed by Newcastle Camper Trailers. Our business has been at the cutting edge of trailer design since 1982. It comes in single cab and dual cab versions to suit almost any ute. Inside it has heaps of space for people as well as gear, yet it will take less than 5 minutes to set up!